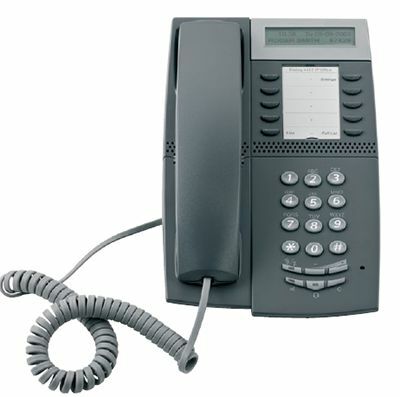 The Mitel 4422 IP phone delivers remarkable value in an enterprise grade desktop phone. Elegant and sophisticated in design, this IP phone features a monochrome LCD display, 13 function keys with integrated LED indicators with 7 programmable function keys for speed dialing or service features supported by the telphony system. In addition to the 4420, the 4422 includes a graphical two-line display for number and name presentation. The display, with adjustable viewing angle, is also used for menu and status information. To further extend the usability, the phone supports one extra Key Panel Unit with 17 programmable keys, and an Option Unit, providing interfaces for extra bell and busy signal/lamp. With the dedicated headset and loudspeaker/hands-free keys, the user can easily switch between the different modes. Mitel's 4400 series IP Phones are easily configured remotely. Software upgrades from a central location simplifies operation and maintenance. With all this plus a PoE Class 1 rating, the Mitel 4422 offers powerful functionality at an exceptional value.